...here we go, I hope you find a quote you can share or one that just inspires. Enjoy. "'Thank you' is the best prayer that anyone could say. to stop and thank the people who make a difference in our lives." "God gave you a gift of 86 400 seconds today. 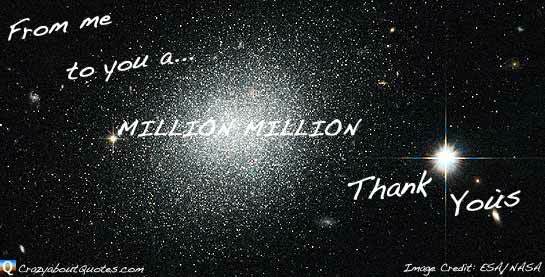 Have you used one to say thank you." "I see the glass half full and thank God for what I have." and without the expectation of anything in return. Truly appreciate life, and you’ll find that you have more of it." for my friends, the old and the new." we experience nothing less than heaven on earth." and all the ups and downs that make it worth living." 'Thank you for that experience.'" for the abundance that exists in your life.